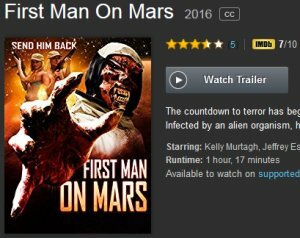 The new feature length Reel Progress sci-fi horror comedy “First Man on Mars” is now available on AMAZON INSTANT VOD. You can rent the film for 7 days or download it as a permanent addition to your collection. Click Here to watch First Man on Mars in HD! This entry was posted in horror on demand, horror vod, indy horror, Low Budget Horror Comedies, science fiction and tagged Amazon Instant, amazon vod, First Man on Mars, Horror Buzz, horror comedy, horror vod, monster, rogue cinema, sci-fi horror. Bookmark the permalink.